John D. Spreckels was a man who had it all. By the 1890s he was richest man in San Diego, the publisher of most of its newspapers, the owner of Coronado Island and the ferry connecting it to the mainland, the proprietor of Belmont Park, and the Coronado and Golden West Hotels. He had thousands of people on his various payrolls, and paid one out of every ten property tax dollars collected in the county. 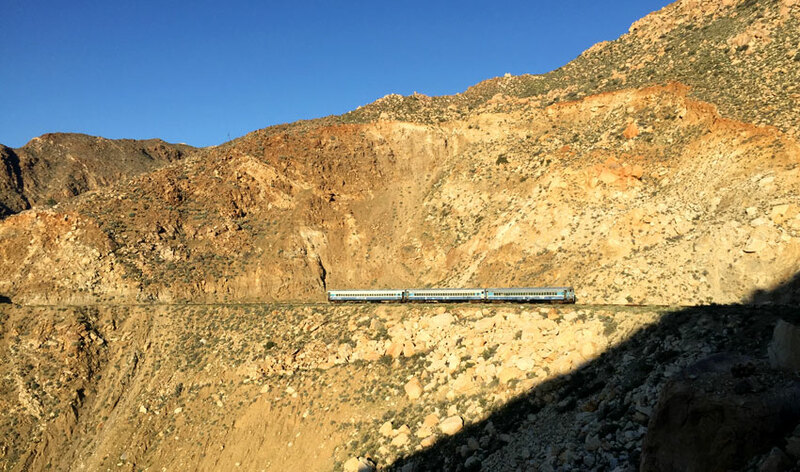 Click and drag to explore the Carrizo Gorge Railway from the Goat Canyon Trestle SW to the railyard at Jacumba and NE to Dos Cabezas. Use the hotspots to navigate the virtual-reality panoramas and explore other features. There are 38 VR nodes in the tour. Click the “M” button to hide the map. Spreckels’ endeavor was, in part, prompted by the introduction of crop irrigation into the California desert wasteland near the Mexican border, now known as the Imperial Valley. This spawned the towns of Brawley and El Centro, soon followed by the arrival from the north of the Southern Pacific Railroad. John Spreckels was quick to see the commercial possibilities of a link between San Diego and the farms of the Imperial Valley, and ultimately the markets of the Eastern United States. He acquired the means to proceed when he convinced the Southern Pacific to become a silent financial partner of this new railroad venture across the 60 miles of mountain ranges that separate the two locations. Poster for the Southern Pacific Railroad. Maurice Logan, 1929. 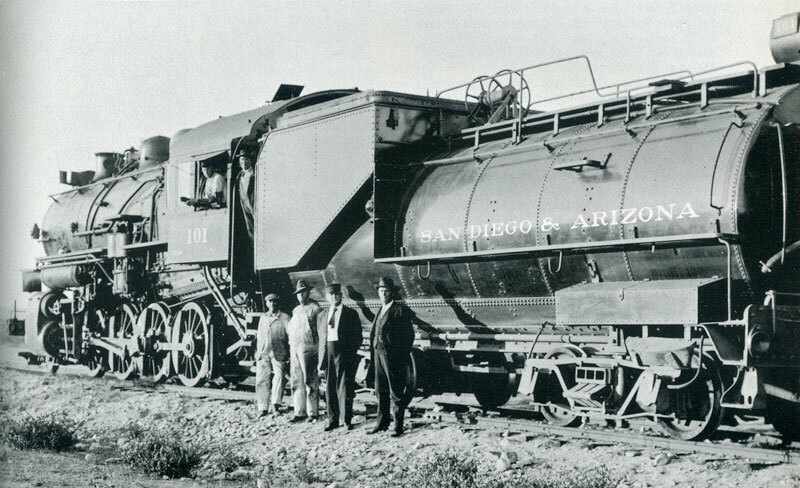 Spreckels was granted a charter for his San Diego and Arizona Railway (SD&A) on December 14, 1906. But it wasn’t until November 15 of 1919 that the first passenger train, called the “Golden Spike Limited,” pulled into San Diego’s Union Station from the eastern terminus of the line in El Centro. 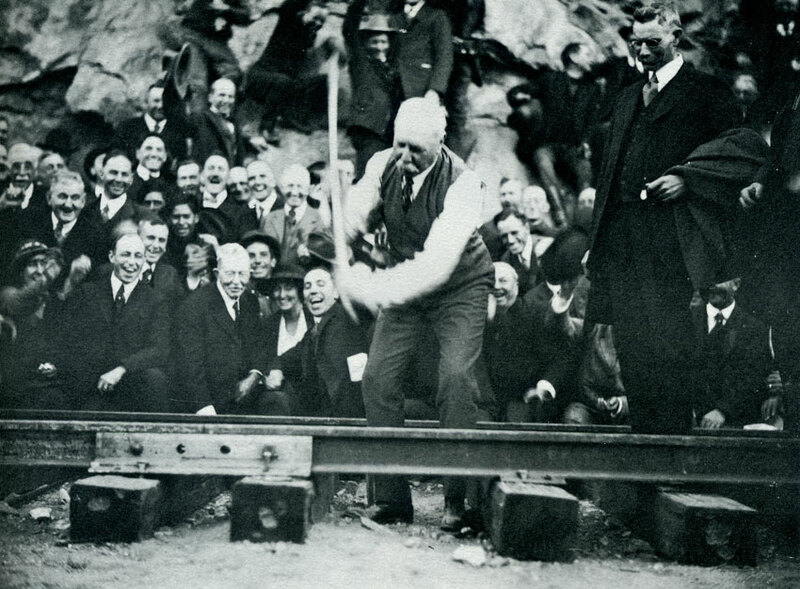 John D. Spreckels himself drove in the $286 golden spike, near tunnel #11. 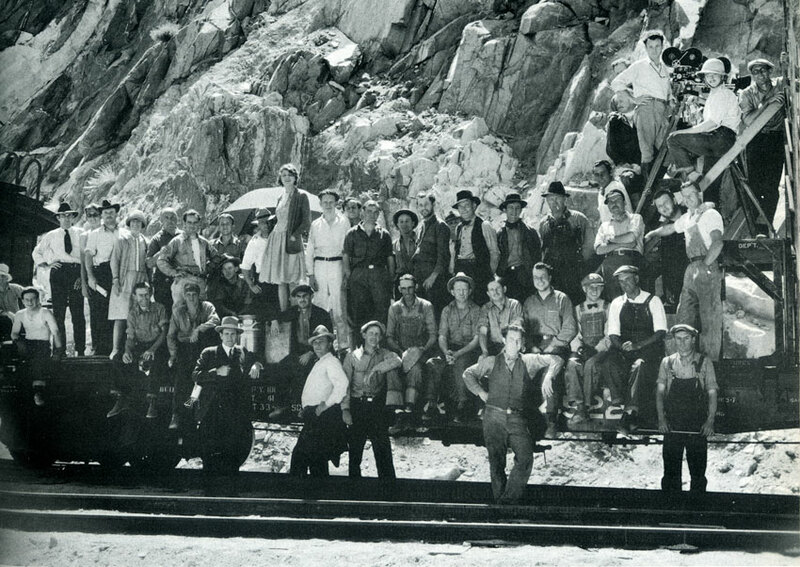 Much of the exterior photography for the 1928 film Beggars of Life was shot in Carrizo Gorge. These segments are excerpted here. The original estimate for construction of the 146.4 miles of track was $6 million. But by the time the line was completed costs had soared to some $18 million ($186 million in 2016 dollars). The most agonizingly difficult challenge for the construction engineers was the 11-mile segment through Carrizo Gorge, which included 17 tunnels, totaling 13,385 feet in length. Carriso Gorge — Across its precipices, its gulfs and crags, and its mountain pinnacles, are spread gorgeous blanket-patterns of color, measured in miles and woven from fluid rocks when the world was made. The reds and oranges of the sunset, splashed upon the walls of the chasms, are broken by lozenges of Navajo black, as big as a house, or edged with a border of white crystal, ten or twenty feet wide and half a mile long. One tunnel in particular would prove especially troublesome, resulting in what would become the spectacular and iconic Goat Canyon Trestle. 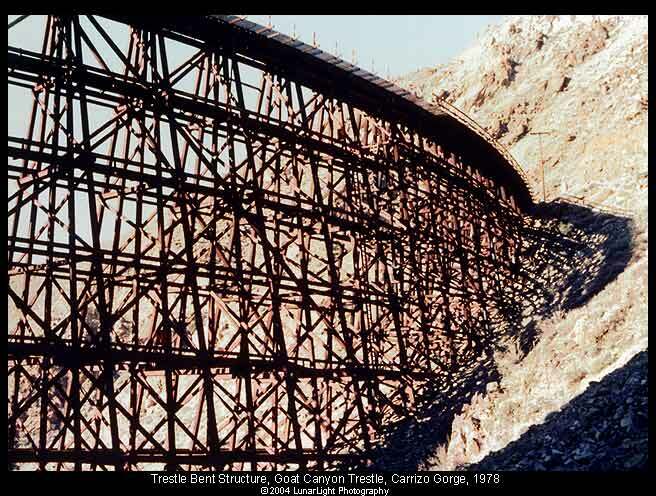 This trestle may be explored at the beginning of the virtual-reality tour of Carrizo Gorge, found at the top of this page. 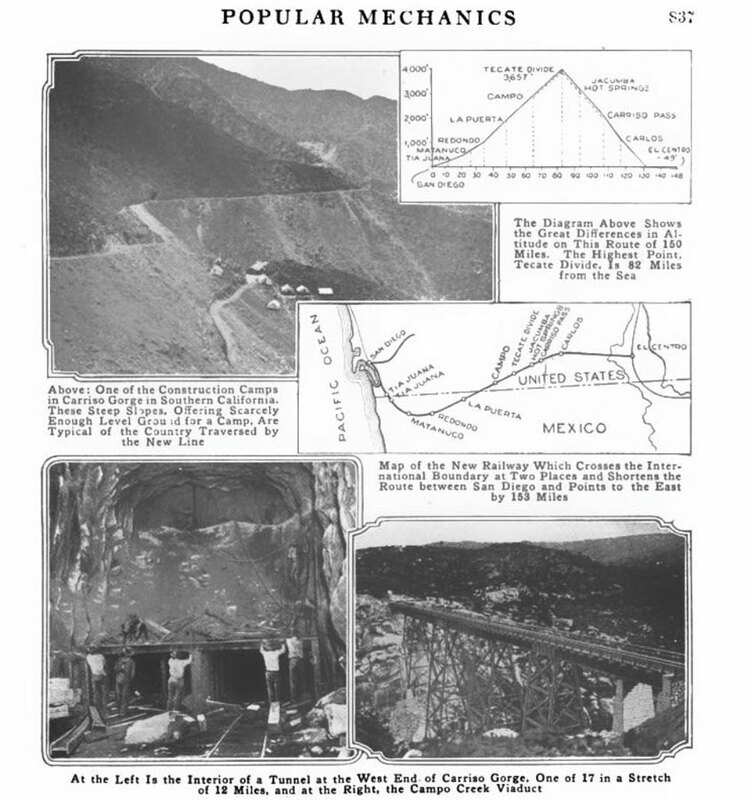 On March 27 1932, a temblor produced a rock slide in the gorge, causing a sudden collapse of parts of Tunnels 7 and of 15, and taking them out of commission. The company decided not to attempt to repair the tunnels because their walls and roofs had been blasted out of heavily fractured rock. Instead the railroad built a curvy bypass route to take the place of Tunnel 7. 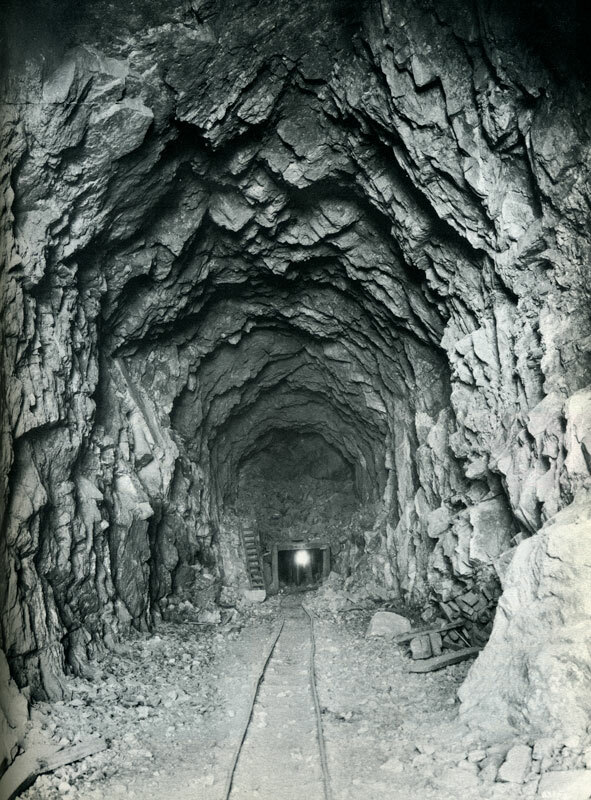 For Tunnel 15, which took the line across Goat Canyon, the railroad eliminated the greater part of it, shrinking the tunnel from 937 feet to 178 feet. 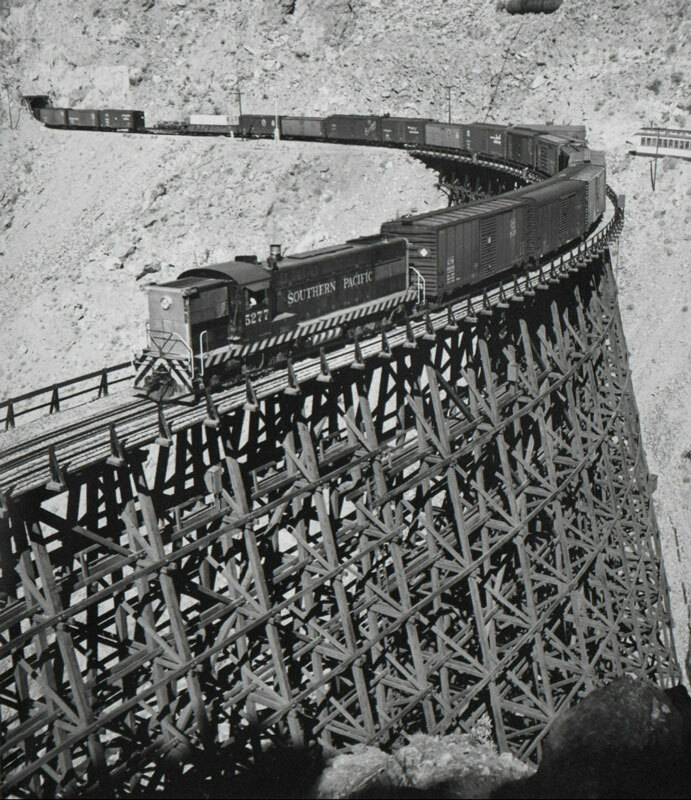 This was accomplished by the construction of a 633-foot-long wooden trestle to span Goat Canyon, the floor of which was a dizzying 185 feet below the rails. 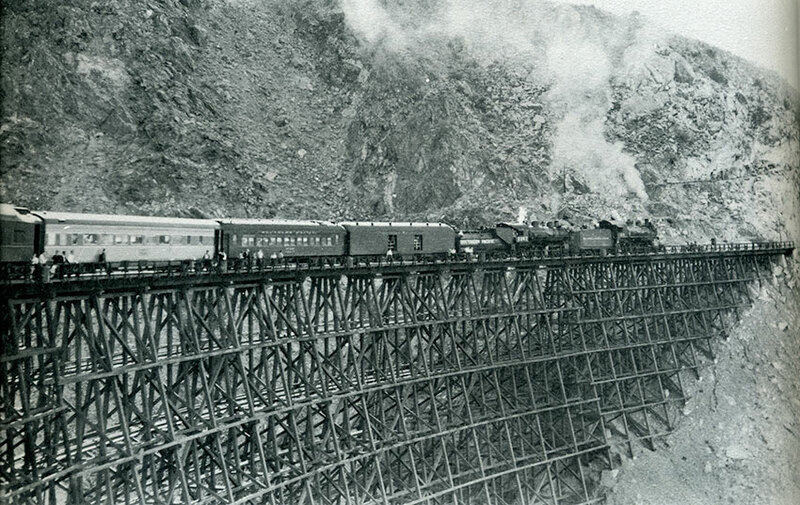 Making the most of this costly ($319,771) 1933 engineering marvel, the company began to brag about it, claiming (erroneously) that passengers would be able to ride across “the highest and longest wooden trestle in the world” in what was to be marketed as the “last transcontinental railroad.” In 1986 the trestle was designated a Historic Civil Engineering Landmark. 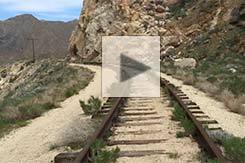 Walk along the rails and through a tunnel of the Carrizo Gorge Railway in Hyperlapse mode. Wooden trestles, especially with spark-spewing steam locomotives in the oven-like summer climate of the Mohave Desert are always a fire hazard. 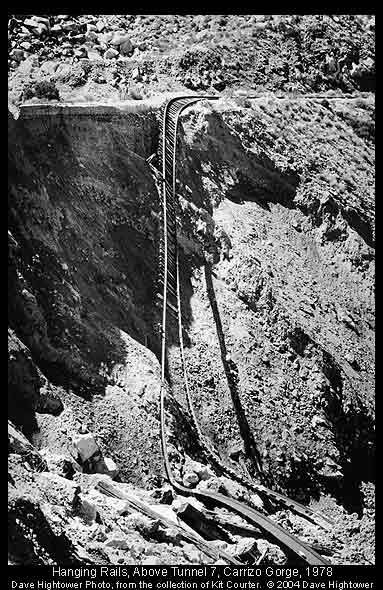 To mitigate this danger, the Goat Canyon trestle was constructed with an elaborate system of water pipes and valves, all connected to a large water tank on the hill above the trestle. The engineering diagram for this system may be seen in the gallery below. 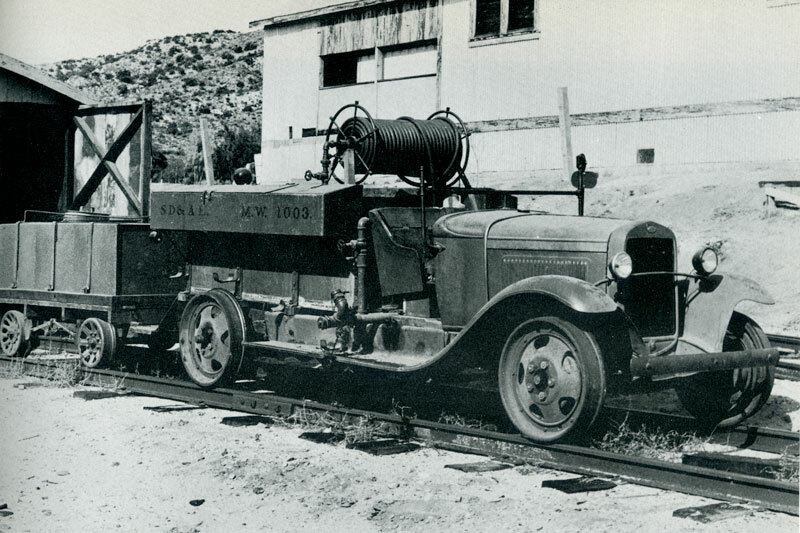 As added insurance, the company mounted a fire engine (in gallery below) on flanged wheels and stationed it at the ready at its Jacumba depot at the southern approach to Carrizo Gorge. Landslides and weather continued to play havoc with the railroad, which was taken over completely by the Southern Pacific in 1932 and renamed the San Diego and Arizona Eastern. 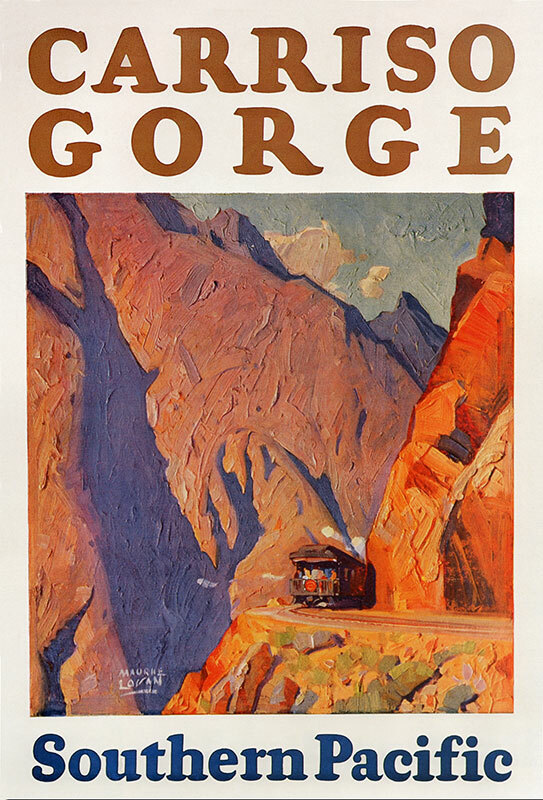 Passenger car service was ended in 1951, after washouts and floods near Tunnel 8 and 10 shut down the line for an extended period while repairs were made. All rail traffic was halted for five years after the remnants of Hurricane Kathleen devastated the route in September of 1976. 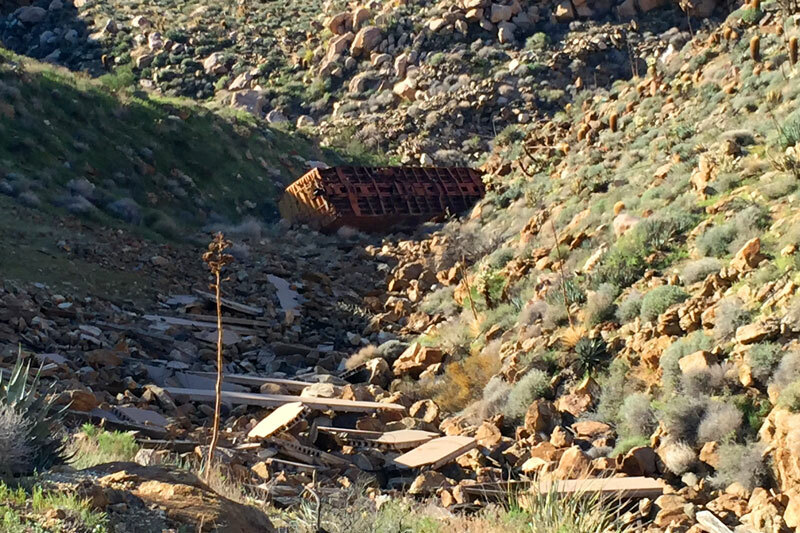 Canyon trestles were washed away when more than a foot of rain fell in some areas, causing catastrophic destruction to nearby Ocotillo, where six people drowned. Three trestles were completely washed away, and five others were damaged. In addition, there were some 50 washouts and rockslides. 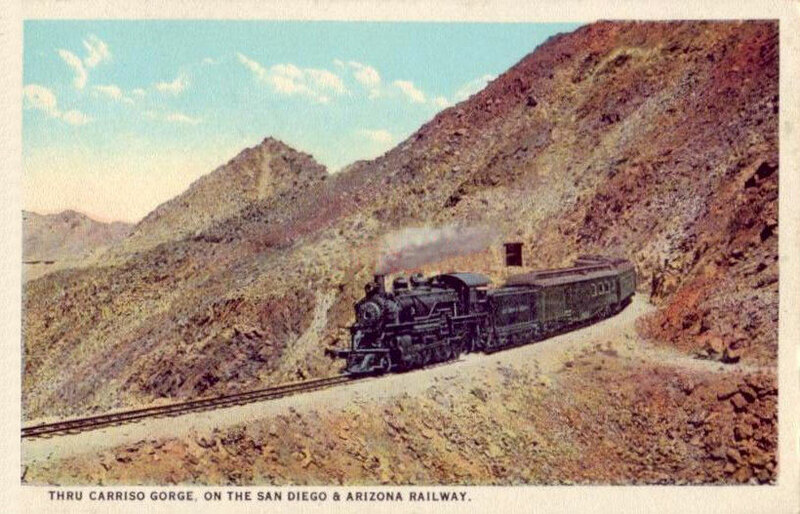 I would ride a train on the newly completed San Diego and Arizona Railway up and out of that great cupped palm…One sat dreamily watching the vast rock rimmed bowl deepen and fill with a violet haze as the train puffed slowly up the steep grade…Steadily now we bored through the mountains–through 21 tunnels in 150 miles. 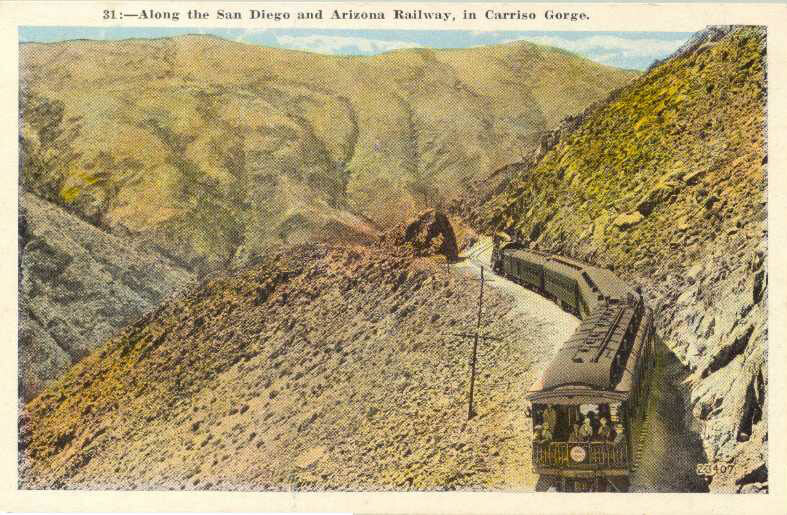 Carrizo Gorge, too little known in America…swallowed us in its magnificent, 11-mile long and 1000-foot deep immensity…And faster now, through pines, great live oaks and cool fresh air, the train rushed on through the night. Frank Waters, The Colorado; Rivers of America Series; quoted in The Impossible Railroad. 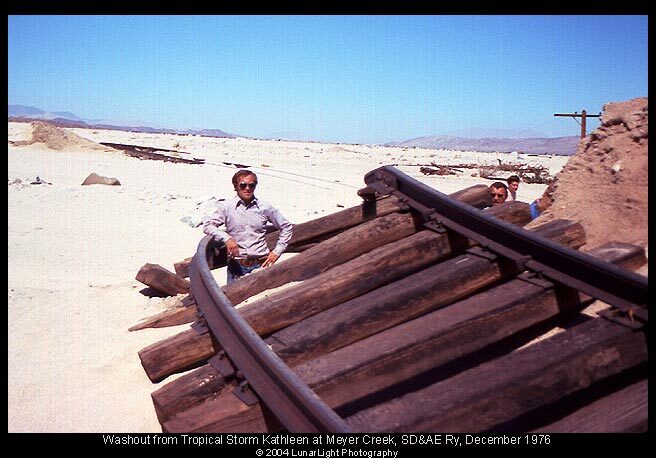 In September of 1976, Hurricane Kathleen roared up the length of the Gulf of California between Baja California and the Mexican Mainland, and before it was finished, it dumped a good dozen inches of water on the Imperial Valley of California within only a very few hours…It left one whole side of Interstate Highway 8 along Meyer Creek…fully missing for several miles…It left the center of the town of Ocotillo washed away or buried in sand. 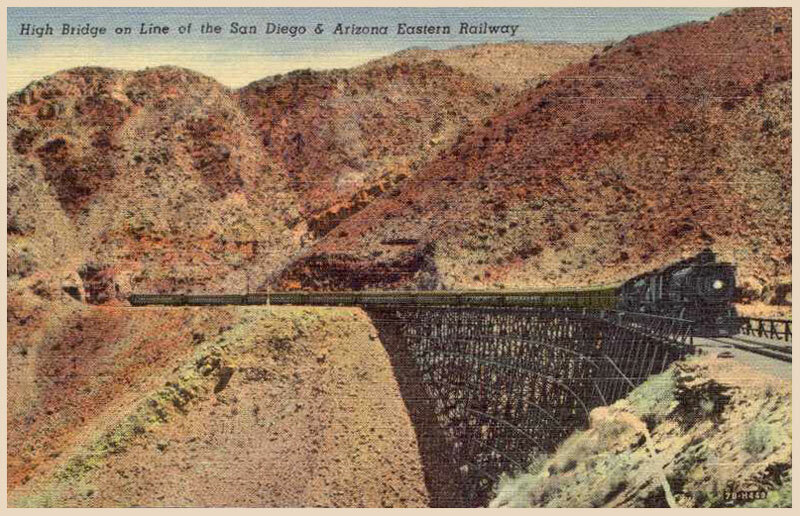 The right-of-way of Southern Pacific’s San Diego and Arizona Eastern Railway stood in the path of this storm, and was subjected to tremendous flash floods at even small canyon crossings. In many places, the line was either buried in mud, as between Jacumba and Dubbers, or washed away. Huge rocks were undermined by the floodwaters and then fell on the rails. A track inspector sent into the gorge to survey the situation during the storm had to abandon his inspection car when it was marooned between two rock slides; he then had to hike back to Dubbers over several miles of line containing serious washouts with up to an eighth-of-a-mile of rail left hanging in the air. 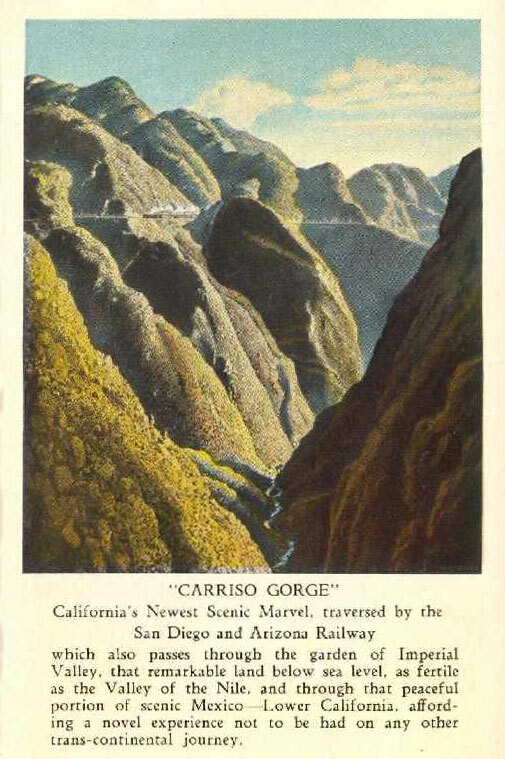 Carriso Gorge the Magnificent was a silent film made for the SD&A in 1923. 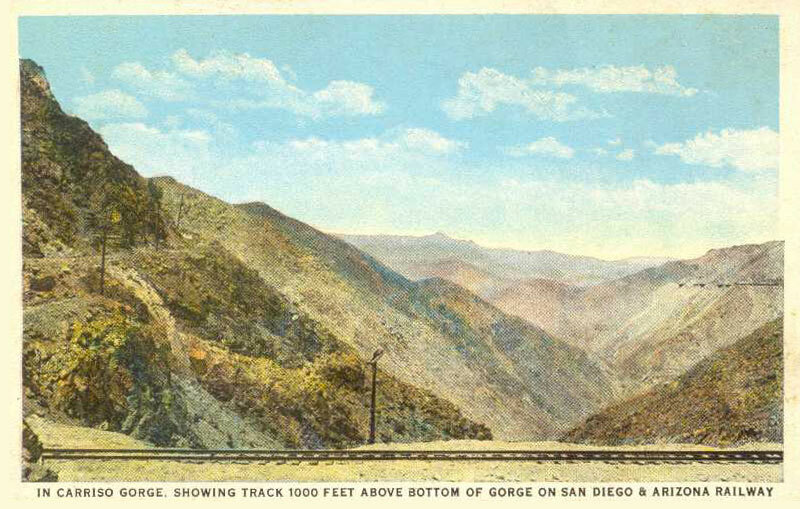 The Carrizo Gorge section of the line was subsequently battered by years of violent storms. In 1979, faced with a daunting bill estimated at $1.27 million dollars to repair a line that was already hemorrhaging money each year, the Southern Pacific pulled the plug on its Impossible Railroad and sold it to San Diego’s Metropolitan Transit Development Board (MTDB) for $18.1 million, after agreeing to first restore the line to operational status. 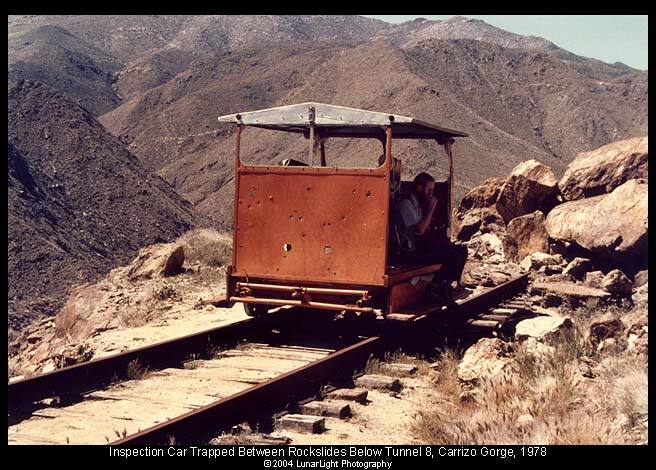 The MTDB originally picked Kyle Railways to operate the SD&AE, and for two years Kyle ran freight through Carrizo Gorge, but this arrangement fell apart in 1983 after two of the trestles were destroyed by fire, followed by the collapse of half-mile-long Tunnel 8. 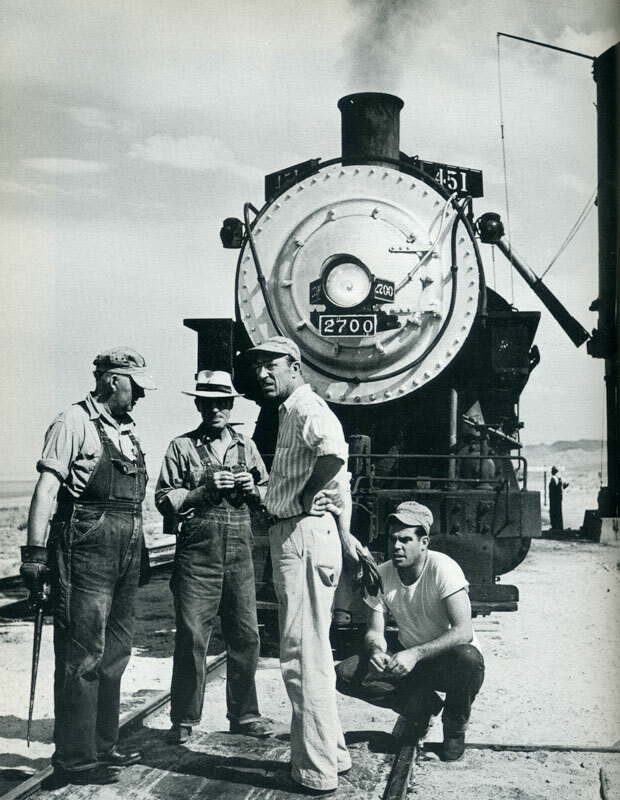 The next corporate entity to attempt a revival of the line was the San Diego and Imperial Valley Railroad (SDIV). But it balked at the price tag for repairing the tunnels and bridges in Carrizo Gorge. Owners of a local construction company, however, felt that they could take on the repairs themselves, and negotiated trackage rights from SDIV in 2003 that allowed them to operate on the line as the Carrizo Gorge Railway. 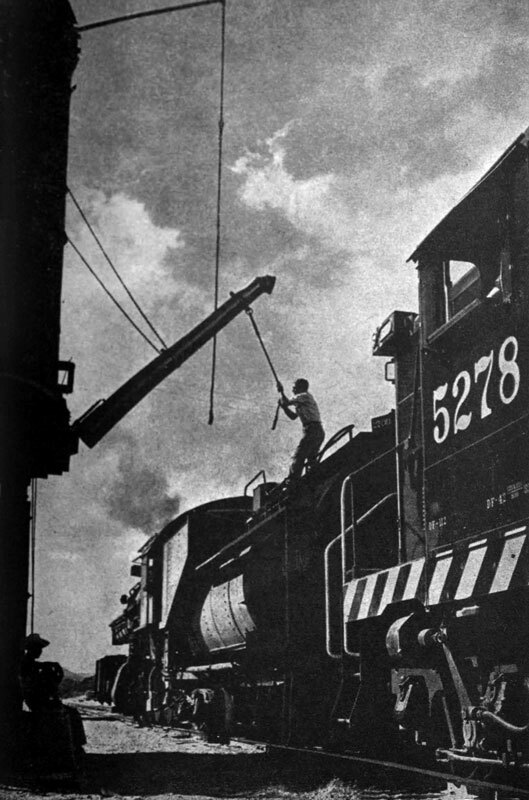 The railway had some initial success hauling sand for mixing concrete from Mexico to San Diego. But in October 2008, with such deteriorated rails, tunnels, and bridges, the route was embargoed for all revenue traffic. Stephen Hager filmed this cab ride on a maintenance train eastbound through Carrizo Gorge in April of 2012 on what was to be one of the last times the railway ran a train through Carrizo Gorge. 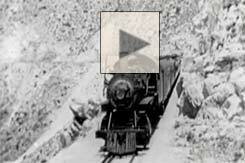 The train enters the gorge around 12 minutes into the video. 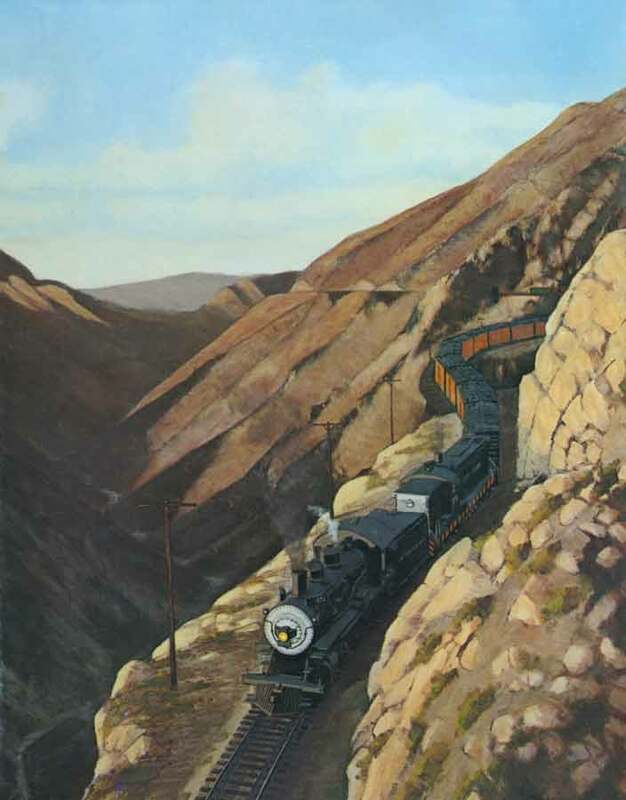 In December 2012 the MTDB ended its arrangement with Carrizo Gorge Railway and entered into a 99-year operating lease for its Desert Line with a new entity, the Pacific Imperial Railway for freight operations. The lease stipulated operating goals and repair timetables (very few of which have been met). The new railway has, however, usually been able to make its annual $1,000,000 payment to MTDB for the right to operate on the line. The principals have also made headlines for their financial shenanigans, labor law violations, and for the 220 lbs. of marijuana discovered hidden on a freight car, for which the company was fined $1.6 million. 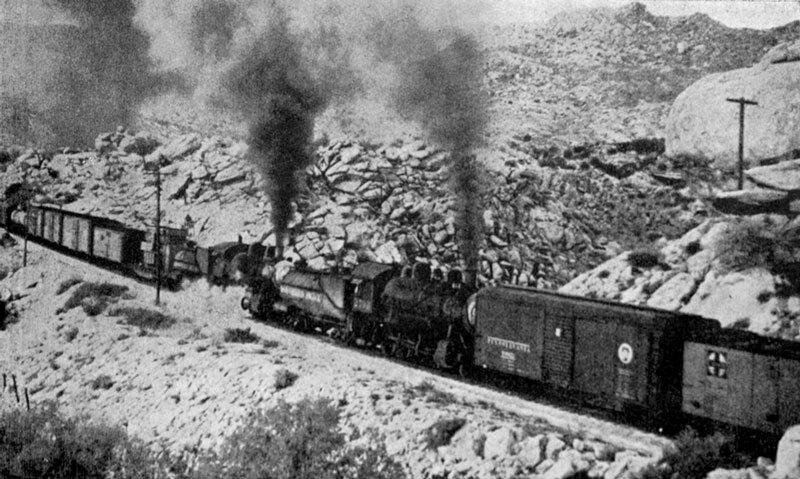 Most observers doubt that revenue freight will ever again traverse Carrizo Gorge. However, the Pacific Imperial Railway contends that there has been some progress on rehabilitating the eastern end of the line, plus a financial restructuring and transfer of ownership. As seen in the virtual tour (top of page) the SW entrance to Carrizo Gorge has been blocked since February 2015 by the vandals who sent derelict railcars careening onto the main line from the spur at Dubbers. Carrizo Gorge is almost entirely contained within California’s Anza Borrego Desert State Park. From one of the park’s highest viewpoints, Sacatone Overlook, you can see seven trestles of the railroad as it snakes its way through Carrizo Gorge in the distance, with the Salton Sea at the horizon. These trestles are known as the “Seven Sisters,” and may be seen below in a gigapixel panorama composited from more than 300 images. While the state park may surround it, the railroad line itself is an long linear island of private property. There is no way to explore Carrizo Gorge that is completely without risk, physical or legal. Hiking into it on an ill-defined trail from Mortero Palms, while legal, is not for the casual hiker. The elevation gains, the summer heat and/or storms, the rattlesnakes, the Cholla cactus, and the Cat’s Claw bush (Acacia greggii, also known at the “wait-a-minute bush”) will make the trip challenging. It is much easier to hike on the tracks, either starting from the north at Dos Cabezas or from the south at De Anza Springs. We walked and made virtual-reality panoramas of the southern half of the line through Carrizo Gorge in March 2015, leaving our car here, just outside the gates to the resort at De Anza Springs. Walking the nearly-level RR grade is not strenuous, but when crossing the many trestles you will be high above the canyon in some places. 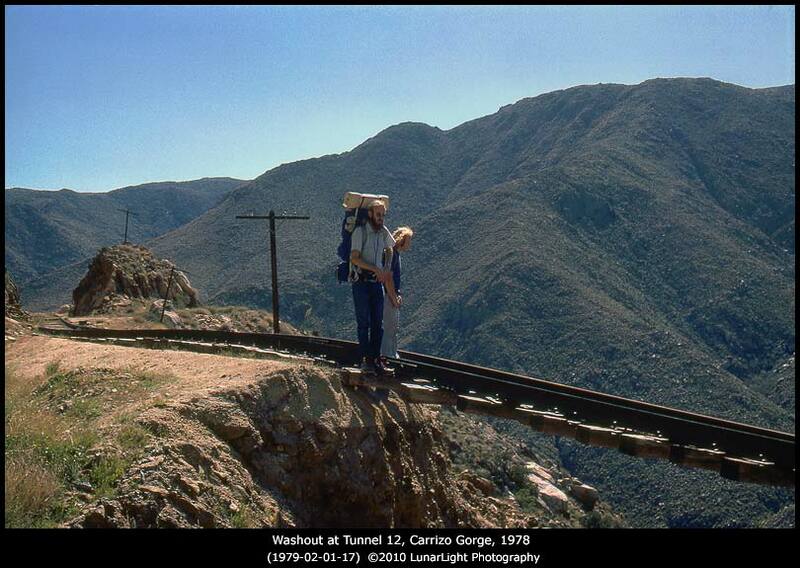 On some of the trestles the metal grating walkways on the inside edge of the canyon have been damaged by rock slides. It may be best to walk on the walkways on the outer edge of the trestles, vertigo be damned. The shorter trestles are lacking the walkways, requiring stepping carefully from crosstie to crosstie; in places the spacing between them is irregular. We photographed the northern half of the Gorge in March 2016, driving our 4WD (required) from Borego Springs. We turned SW on Montero Canyon Road here, where it begins off of Sweeny Pass Rd (Imperial Highway, or S2). Just before reaching the water tower the road intersects with Dos Cabezas Rd, which may be followed N until it ends here. Alternatively, if coming from the Ocotillo exit on I-8, you can turn directly onto Dos Cabezas Rd from S2. On the northern segment of the canyon you will note a couple of places, far below at the bottom of the gorge, where freight cars have fallen off the tracks. 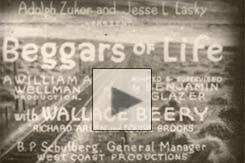 Some are the remnants of a 1928 movie, Beggars of Life, shot in the gorge. Scenes from the film are excerpted on this page, above left. 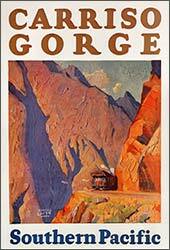 Another two boxcars careened down into the gorge filled with trailer loads of Coors beer, to the delight of many. Yet another wreck left a hillside littered with precast concrete beams. More facts and folklore regarding the wrecks may be read here. 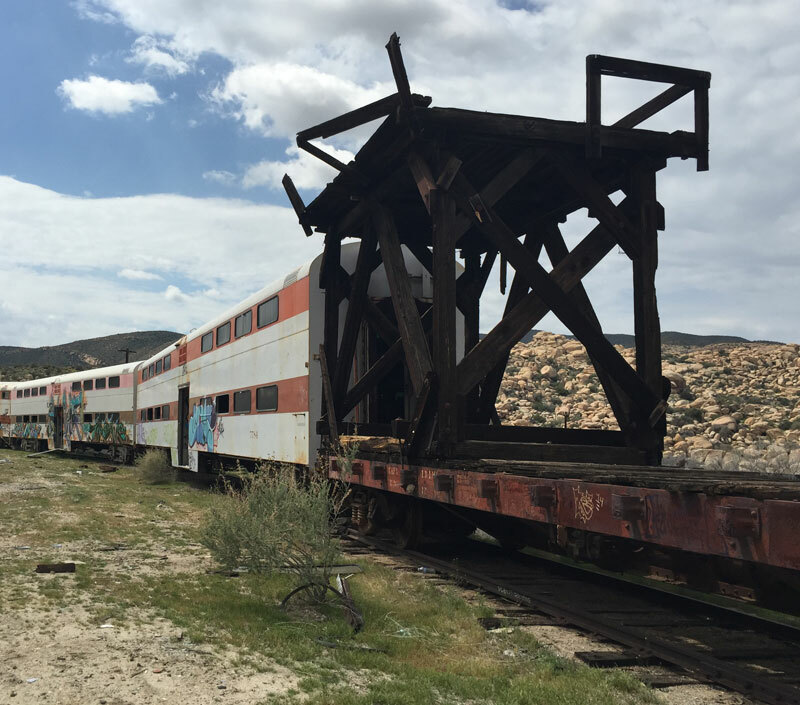 You will also encounter on the southern section of the canyon two different sets of “ghost trains,” abandoned passenger cars purchased by the Carrizo Gorge Railway in anticipation of commuter service between Tijuana and Tecate in Mexico, or perhaps for taking tourists through the Gorge. 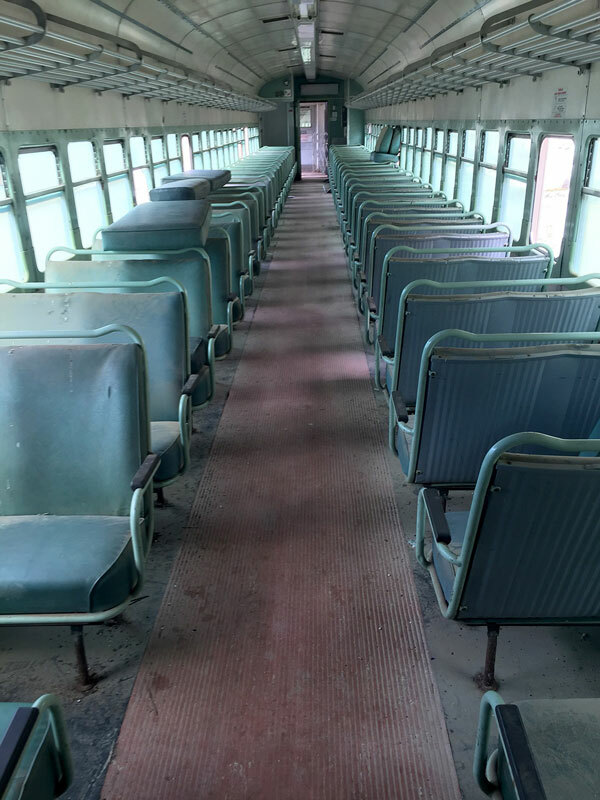 In the virtual-reality tour at the top of the page, clicking the map hotspot at De Anza Springs will take you to the five cars of the Chicago Metra line, vandalized and covered in graffiti. 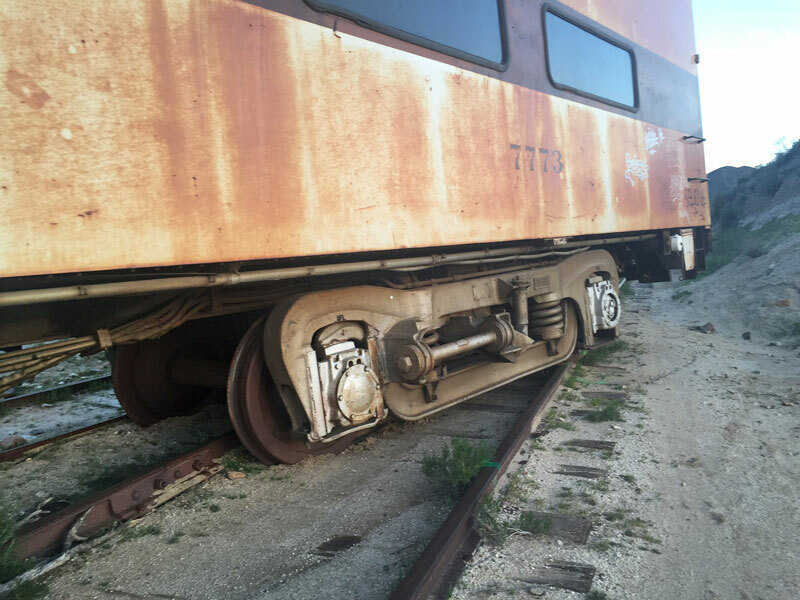 Coupled to the end of the Metra cars is a flatcar with a tall wooden platform, used by the railroad to inspect the ceilings of the many tunnels. This may be seen in the gallery below. As we walked through the tunnels it became clear that tunnel inspections were sorely needed, as the tracks were blocked in some places by giant boulders which crashed down from above, hopefully when no hikers were anywhere nearby. 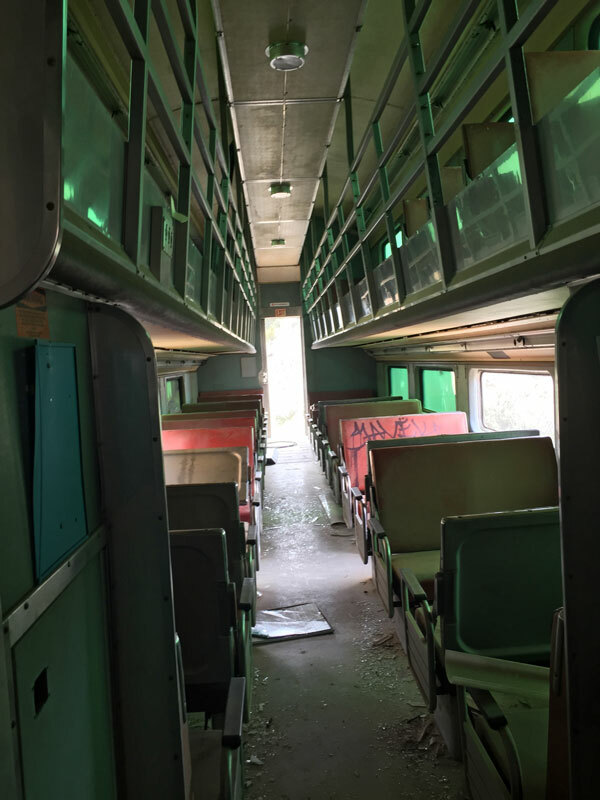 The third map hotspot north will bring you to another railcar graveyard of three derelict and vandalized cars. These are the STCUM cars (Société de transport de la Communauté Urbaine de Montréal). 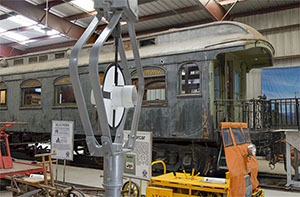 John D. Spreckles ornate business car, the Carriso Gorge, is now on display at the Pacific Southwest Railway Museum, where it is awaiting restoration. Click to learn more, and to enter the car in virtual reality. 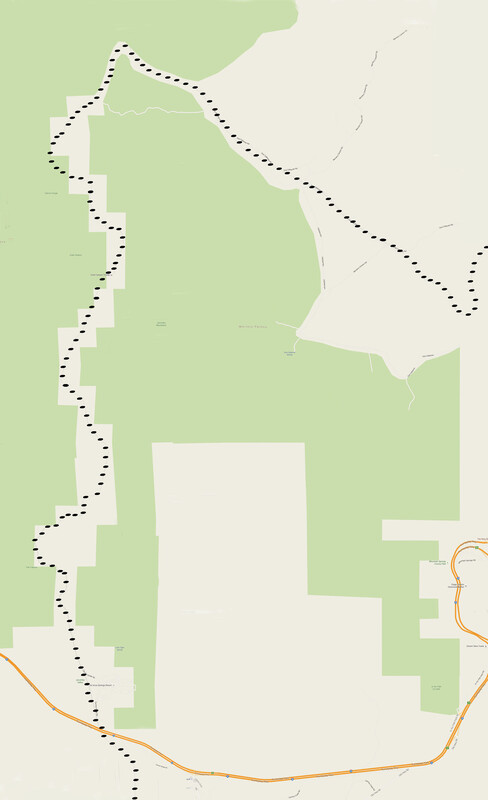 The walk from De Anza Springs to the Goat Canyon Trestle and back is 14 miles. 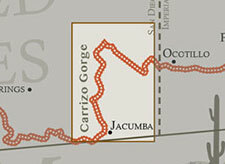 A round-trip hike from the end of the road at Dos Cabezas to the trestle is 10 miles. It took us two visits (in two different years) to walk all 24 miles. If you have two 4WD vehicles, and start early in the morning (or the night before), a bit of car-shuttling would allow you to hike the 12 miles through Carrizo Gorge in one day. Leave one car at the end of Dos Cabezas Rd., then drive in the other car to De Anza Springs. Begin your hike there, walking the rails the 12 miles northeast to your vehicle at Dos Cabezas, and plan to drive out on the Dos Cabezas Road while you have some daylight remaining. Then retrieve your other vehicle at De Anza Springs, where you can celebrate your accomplishment with a libation at the “Come-As-You-Are Bar” at the clothing-optional De Anza Springs Resort. Some folks enjoy mountain biking, motorbiking, or railbiking on the right-of-way. Trails running on the hillsides parallel to the railroad, built by construction crews, are used today by hikers and mountain bikers. Don’t try this one. 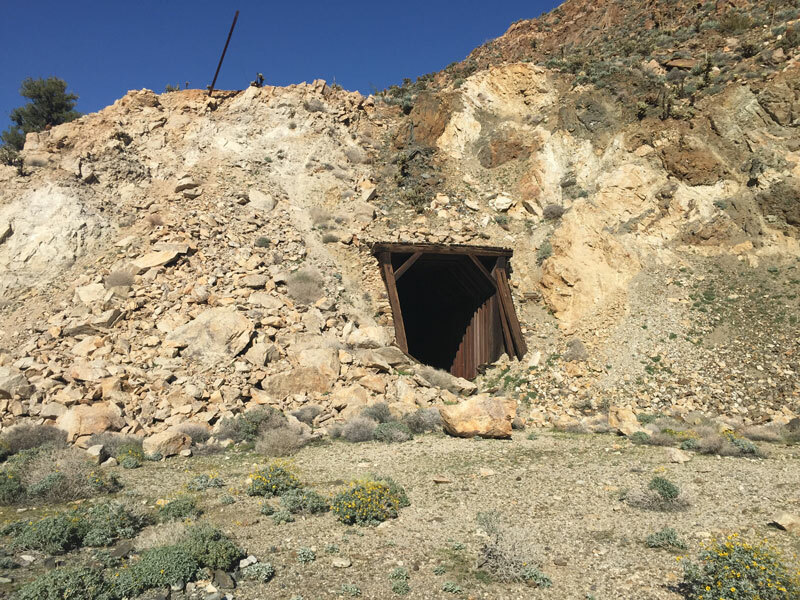 UPDATE: Sometime in late 2016 or early 2017 the east entrance to tunnel 16a (immediately east of the Goat Canyon Trestle) collapsed. 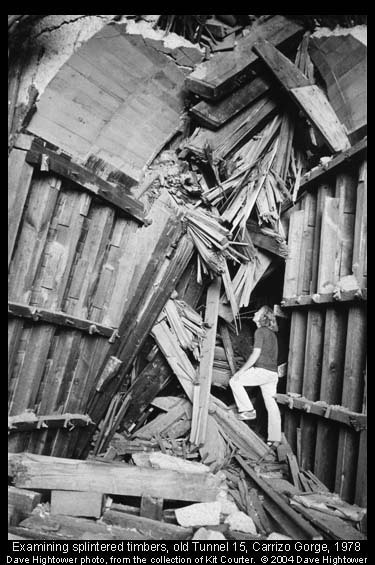 While this video shows people scrambling over the rockpile blocking the tunnel, its unstable roof would probably mean that we will not again walk through it. There is a hillside path around the tunnel. 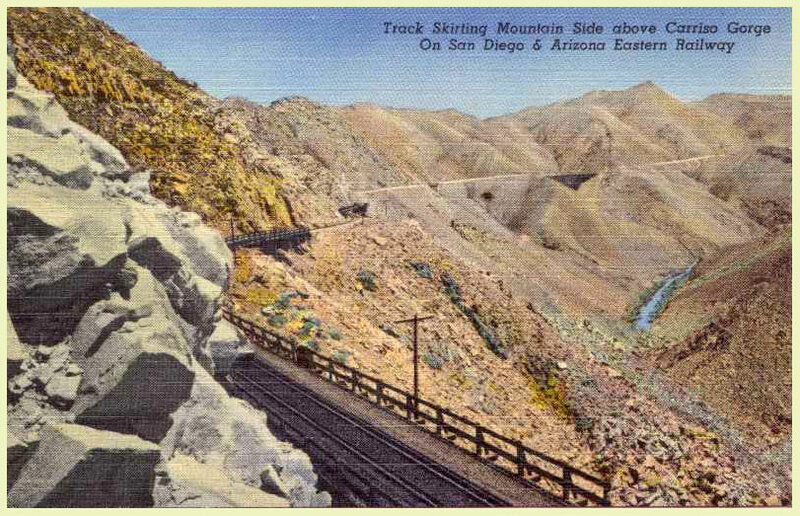 One way—entirely safe—to explore Carrizo Gorge is to visit the model railway at San Diego’s Balboa Park, the park endowed by John D. Spreckels. There, the scene replicates one particular day in 1949 along the San Diego & Arizona Eastern Railway. The gigapixel panorama below shows the “Seven Sisters” trestles of the railroad in Carrizo Gorge, as seen from the Sacatone Overlook. To explore the scene in detail, click the full screen button, and then zoom in by clicking in the image, or by using the buttons provided. The Salton Sea can be seen far in the distance. Zoom in to find the wrecked freight cars below one of the trestles. Note: some of the information and photographs on this page are credited, with much appreciation, to the engrossing and encyclopedic SD&A source, Robert M. Hanft’s “The Impossible Railroad,” now out of print. I’m the one who’s ride report on ADV Rider you linked in your article here. Happy to see you used it as a reference! If you have any questions about the ride or anything, I’m happy to help, or provide additional info, details, or pictures if you need them! In the winter of 83 i rode that train from Placerville to ysidro. The most incredible train ride of my life. 3 ingines pulled 5 box cars. Their was a coors trailer that had slid part way down the mountain and it looked then as if it had not been opened. I wanted to jump off and make a home in that trailer that i i agined to be full. Ill tell you something. Way down in that gorge is a train. Engine, passenger cars and caboose at the bottom. Looks like its from the 20s or 30s. That gorge has big magic. on November 15, 1919. The first Revenue trains ran the first week of December 1919! This was the site of Carriso Siding that was added after the railroad began operating. That’s awesome that the Jacumba police officer was cool with you walking the tracks. I think the best route to Goat Canyon trestle is along the tracks from a small dirt road west of Dos Cabezas that terminates at the tracks between the first two tunnels going south. It’s 3.3 miles one way, crossing the seven trestles and passing through several tunnels (or around on the trail used by workers building the line). I have wanted to hike this Goat Canyon Trestle for the past two years, but always hesitate because of some articles stating that it is illegal to hike through the 12 miles rail road. I finally made up my mind to do this hike in a couple days. Do you by any chance have any information and update from the legal authority / police / railroad police about this route? 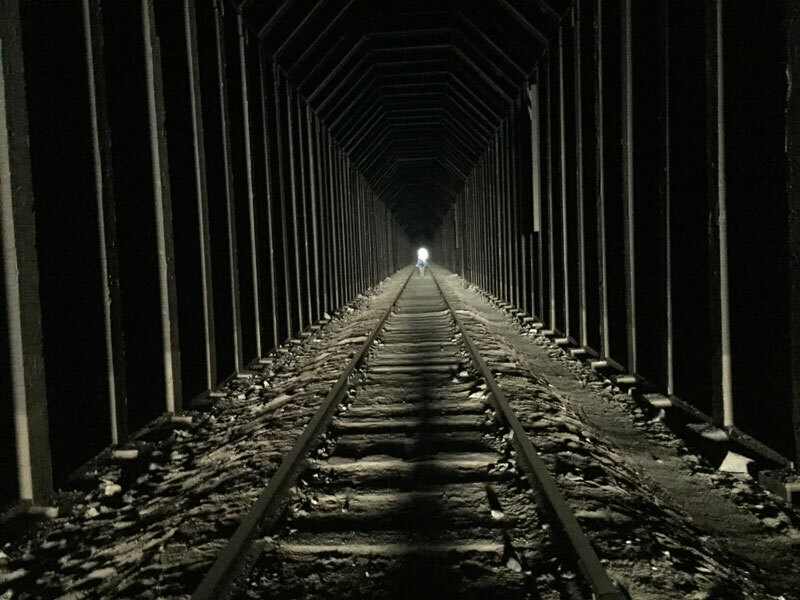 After reading your article and you mentioned that the Jacumba police said no problem to hike the rails and tunnels, it makes me want start exploring the trestle as soon as possible. Any information will be appreciated. Thank you.